The Earth's atmosphere is a layer of gases surrounding our planet and retained by the Earth's gravity. It contains roughly 78 percent nitrogen and 21 percent oxygen, with small amounts of carbon dioxide, water vapor, and other gases. This mixture of gases is commonly known as air. Based on its properties, the atmosphere is divided into several layers, but it has no abrupt, outermost boundary. It slowly becomes thinner and fades away into outer space. The atmosphere protects and sustains life on Earth in a variety of ways. It provides oxygen for respiration, carbon dioxide for photosynthesis, nitrogen for nitrogen fixation, and water vapor for precipitation that nourishes the land. Carbon dioxide and water vapor reduce temperature extremes between day and night, keeping the planet warm enough for living organisms. The ozone layer absorbs ultraviolet solar radiation that could damage living tissue, and higher layers protect the Earth from bombardment by meteorites and charged particles in the solar wind. One area of concern, though, is that human activities such as fuel burning and industrial production have been releasing pollutants into the atmosphere. In response, the governments of various nations have instituted measures to reduce the emission of pollutants. The properties of the Earth's atmosphere vary with altitude. Based on these properties, the atmosphere may be regarded as having different layers or zones. According to one system of nomenclature, there are five layers: the troposphere, stratosphere, mesosphere, thermosphere, and exosphere. The boundaries between these regions are called the tropopause, stratopause, mesopause, and exobase. The troposphere (from the Greek words tropos = to turn or mix, and sphaira = ball) is the atmosphere's lowest and densest layer, and it is also known as the lower atmosphere. It starts from the Earth's surface and reaches up to about 7 km (4.35 miles) at the poles and 17 km (10.5 miles) at the equator, with some variation caused by weather factors. 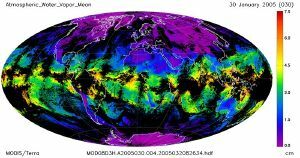 The upper boundary of this layer is called the tropopause. The troposphere has a great deal of vertical mixing of its constituent gases, as a result of solar heat. As the Sun heats the Earth's surface, the air masses near the surface become warmer, rise, and release heat. That process further buoys the air masses. This sequence continues until all the water vapor in the air is removed. The temperature of the troposphere decreases with height. At middle latitudes, the temperature drops from about +17° C (62° F)at sea level to about -52° C (-62° F) at the beginning of the tropopause. At the poles, the troposphere is thinner and the temperature falls to only -45° C (-49° F), while at the equator, the temperature at the top of the troposphere can reach -75° C (-103° F). The stratosphere (from the New Latin word stratum = spread or bed) is situated directly above the troposphere and just below the mesosphere. In terms of its altitude range, it lies between about 10 km and 50 km at moderate latitudes, but it starts at about 8 km at the poles. This layer is dynamically stable, with no regular mixing of air and associated turbulence. The stratosphere is stratified (layered) in temperature, with warmer layers higher up and cooler layers farther down—the reverse of the temperature variation in the troposphere. The upper layers of the stratosphere are heated by the presence of an ozone layer that absorbs ultraviolet (UV) radiation from the Sun—radiation that would otherwise be harmful to living organisms on Earth. The stratopause (at the top of the stratosphere) has a temperature of about 270K—fairly close to the temperature at ground level. The base of the stratosphere occurs where heating by conduction from above and convection from below (through the troposphere) balance out. The stratosphere begins at lower altitudes near the poles because the ground temperatures are lower there. Commercial airliners typically cruise at an altitude near 10 km in temperate latitudes, in the lower reaches of the stratosphere. In this manner, they avoid the atmospheric turbulence that occurs in the troposphere. The mesosphere (from the Greek word mesos = middle) is the layer between about 50 km and about 80–85 km above the Earth's surface. It is sandwiched between the stratosphere and the thermosphere. The temperature in this layer decreases with increasing altitude and can be as low as 200K (≈ -73° C, -99° F), varying according to latitude and season. Given that it lies between the maximum altitude for most aircraft and the minimum altitude for most spacecraft, this region of the atmosphere is directly accessible only through the use of sounding rockets. As a result, it is one of the most poorly understood regions of the atmosphere. Millions of meteors burn up daily in the mesosphere, as a result of collisions with the gas particles contained there, leading to a high concentration of iron and other metal atoms. The collisions almost always create enough heat to burn the falling objects long before they reach the ground. Thus the mesosphere protects the Earth from a barrage of would-be meteorites. The stratosphere and mesosphere are referred to as the middle atmosphere. Regions above the mesosphere are called the upper atmosphere. The mesopause, at an altitude of about 80 km, separates the mesosphere from the thermosphere. The mesopause lies near the turbopause, the band below which different chemical species are well mixed by turbulent eddies. The thermosphere (from the Greek word thermos for heat) extends from an altitude of 80–85 km to 640+ km. It lies directly above the mesosphere and right below the exosphere. At these high altitudes, the residual atmospheric gases sort into strata according to their molecular masses. The temperature in this layer increases with altitude, due to the absorption of extremely energetic solar radiation by the small amount of oxygen present. Temperatures are highly dependent on solar activity and can rise to 2,000° C. Solar radiation causes the air particles in this layer to become ionized, that is, electrically charged (see Ionosphere under Additional atmospheric regions). Astronauts travel at altitudes that exceed 80 km (50 miles), which means that they travel within or go beyond the thermosphere. An altitude of 120 km (75 miles) marks the boundary where atmospheric effects become noticeable during re-entry. The exosphere (from the Greek word exo = out or outside) is the uppermost layer of the atmosphere. Its lower boundary at the edge of the thermosphere is estimated to be 500 km to 1,000 km above the Earth's surface, and its upper boundary at about 10,000 km. It is only from the exosphere that atmospheric gases can, to any appreciable extent, escape into outer space. The main gases in the exosphere are the lightest ones, mainly hydrogen and helium, with some atomic oxygen near the exobase (the lowest altitude of the exosphere). The few particles of gas here can reach 2,500° C (4,500° F) during the day. The atmosphere in this layer is sufficiently rarified for satellites to orbit the Earth, although they still receive some atmospheric drag. The exact altitude at which the exosphere ends and space begins is not well-defined, and attempting to attach a specific value to it is not particularly useful. Atmospheric regions are also named in other ways, as follows. Ozone layer (Ozonosphere): In the stratosphere, in an altitude range of about 10–50 km, the concentration of ozone (O3) is a few parts per million, which is much higher than the ozone concentration in the lower atmosphere (although it is still small compared to the main components of the atmosphere). This layer, known as the ozone layer, is vitally important to life because it absorbs biologically harmful UV radiation from the Sun. Moreover, the absorbed solar energy raises the temperature of this part of the atmosphere, creating a thermal barrier that helps trap the atmosphere below, preventing it from bleeding out into space. Ionosphere: This is the region of the atmosphere that contains ions (that form a "plasma"), created by the interaction of solar radiation with gas particles. The ionosphere overlaps with the mesosphere and thermosphere, going up to an altitude of 550 km. Its value in practical terms is that it enables the propagation of radio wave signals, which bounce off the ions and can be transmitted to distant places on the Earth. Magnetosphere: It is the region where the Earth's magnetic field interacts with the solar wind. Its inner boundary is the ionosphere, but it extends for tens of thousands of kilometers, with a long tail away from the Sun. Van Allen radiation belts: These are regions where charged particles (forming a plasma) from the solar wind are trapped by the Earth's magnetic field. When the belts "overload," particles strike the upper atmosphere and fluoresce, producing the effects known as the polar auroras. Qualitatively, there are two belts: an inner belt, consisting mostly of protons, and an outer belt, consisting mostly of electrons. Homosphere (or Turbosphere) and Heterosphere: The region below the turbopause (that is, below an altitude of about 100 km) is known as the homosphere or turbosphere, where the chemical constituents are well mixed and the composition of the atmosphere remains fairly uniform (see Composition of the atmosphere below) . The region above the turbopause is called the heterosphere, where, in the absence of mixing, the chemical composition of the atmosphere varies (see Composition of the heterosphere below). Atmospheric pressure (or barometric pressure) is a direct result of the weight of the air. It is highest at the Earth's surface and decreases with altitude. This is because air at the surface is compressed by the weight of all the air above it. Air pressure varies with location and time, because the amount (and weight) of air above the Earth varies with location and time. Atmospheric pressure drops by approximately 50 percent at an altitude of about 5 km. (In other words, about 50 percent of the total atmospheric mass is within the lowest 5 km). The average atmospheric pressure at sea level is about 101.3 kilopascals (about 14.7 pounds per square inch). The density of air at sea level is about 1.2 kg/m3, and it decreases as altitude increases. The average mass of the atmosphere is about 5,000 trillion metric tons. 57.8 percent of the atmosphere is below the summit of Mount Everest. 72 percent of the atmosphere is below the common cruising altitude of commercial airliners (about 10,000 m or 32,800 ft). 99.99999 percent of the atmosphere is below the highest flight altitude of the aircraft X-15, which reached 354,300 ft (108 km) on August 22, 1963. Therefore, most of the atmosphere (99.9999 percent) is below 100 km, although in the rarified region above this there are auroras and other atmospheric effects. The atmosphere exists at altitudes of 1,000 km and higher, but it is so thin as to be considered nonexistent. Composition of Earth's atmosphere. The lower pie represents the least common gases that compose 0.038% of the atmosphere. Values normalized for illustration. Source for figures above: NASA. Carbon dioxide and methane updated (to 1998) by IPCC TAR table 6.1 . The NASA total was 17 ppmv over 100%, and CO2 was increased here by 15 ppmv. To normalize, N2 should be reduced by about 25 ppmv and O2 by about 7 ppmv. Above the turbopause (about 100 km), the Earth's atmosphere begins to have a composition that varies with altitude. This is essentially because, in the absence of mixing, the density of a gas falls off exponentially with increasing altitude, at a rate that depends on the molecular mass of the gas. Higher mass constituents, such as oxygen and nitrogen, fall off more quickly than lighter constituents such as helium, molecular hydrogen, and atomic hydrogen. Thus, as the altitude increases in the heterosphere, the atmosphere is dominated successively by helium, molecular hydrogen, and atomic hydrogen. The precise altitude of the heterosphere and the layers it contains varies significantly with temperature. The Earth's atmosphere plays a vital role in sustaining life on this planet. Oxygen is needed for respiration by animals, plants, and some bacteria. Nitrogen is an inert gas that reduces the amount of oxygen available for the oxidation of natural materials, thus restricting spontaneous combustion (burning) of flammable materials and the corrosion of metals. Nitrogen is also used by "nitrogen-fixing" bacteria to produce compounds that are useful for plant growth. Plants that perform photosynthesis take up carbon dioxide from the air and release oxygen. Carbon dioxide and water vapor act as "greenhouse gases" that keep the Earth sufficiently warm to maintain life. Water vapor in the air is part of the water cycle that produces precipitation (such as rain and snow) that replenishes moisture in the soil. In addition, water vapor prevents exposed living tissue from drying up. Moreover, several regions of the atmosphere exert their protective effect from a distance. For instance, the ozone layer absorbs UV radiation that can damage the tissues and genetic material of living organisms. The mesosphere, in which millions of meteors burn up daily, protects the Earth's surface from being continually bombarded by these falling objects. The magnetosphere, which extends well beyond the atmosphere, protects the Earth from the damaging rain of charged particles carried by the solar wind. The history of the Earth's atmosphere prior to one billion years ago is poorly understood, but one plausible sequence of events is given below. The modern atmosphere is sometimes referred to as Earth's "third atmosphere," to distinguish its chemical composition from two notably different earlier compositions. It is thought that the original atmosphere was primarily helium and hydrogen. Heat (from the still-molten crust and the Sun) dissipated this atmosphere. About 3.5 billion years ago, the surface had cooled sufficiently to form a solid crust, still heavily populated with volcanoes that released steam, carbon dioxide, and ammonia. This led to formation of the "second atmosphere," composed primarily of carbon dioxide and water vapor, with some nitrogen but virtually no oxygen. (Simulations run at the University of Waterloo and University of Colorado in 2005 suggested that it may have had up to 40 percent hydrogen ). This second atmosphere had approximately 100 times as much gas as the current atmosphere. It is generally believed that the greenhouse effect, caused by high levels of carbon dioxide, kept the Earth from freezing. During the next few million years, water vapor condensed to form rain and oceans, which began to dissolve carbon dioxide. Approximately 50 percent of the carbon dioxide was absorbed into the oceans. Fossil evidence indicates that cyanobacteria were among the earliest types of bacterial life, existing approximately 3.3 billion years ago. They were the first organisms to carry out the photosynthetic conversion of carbon dioxide into oxygen, thus playing a major role in transforming the atmosphere from an anoxic state (a state without oxygen) to an oxic state (a state with oxygen). Oxygenation of the atmosphere is thought to have led to mass extinctions of species. Later, photosynthesizing plants emerged and converted more carbon dioxide into oxygen. Over time, excess carbon became locked into fossil fuels, sedimentary rocks (notably limestone), and animal shells. As oxygen was released, it reacted with ammonia to generate nitrogen. In addition, bacteria also converted ammonia into nitrogen. As more plants appeared, the levels of oxygen increased significantly, while carbon dioxide levels dropped. At first, the oxygen combined with various elements (such as iron), but eventually oxygen accumulated in the atmosphere. With the appearance of an ozone layer, life forms were better protected from UV radiation. This oxygen-nitrogen atmosphere is the "third atmosphere." 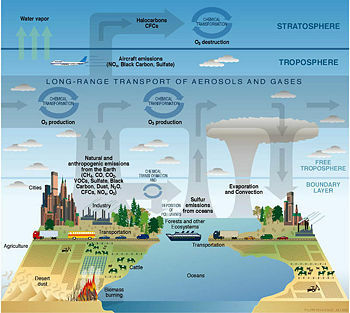 Diagram of chemical and transport processes related to atmospheric composition. Although technological advances have benefited humankind in numerous ways, they have been accompanied by adverse effects on the environment, including pollution of the air. Common air pollutants include carbon monoxide (CO), nitrogen oxides (NOx), sulfur oxides (SOx), ozone, and particulate matter (PM). They are generally produced by such activities as (a) combustion (burning) of fuels for transportation and the generation of heat and electricity, and (b) industrial processes, including petroleum refining, cement manufacturing, and metal processing. Carbon monoxide, a product of the incomplete combustion of fuels, is present at relatively high concentrations near roadways with heavy vehicular traffic. Inhalation of high levels of carbon monoxide can cause headaches, fatigue, respiratory problems, and (in extreme cases) death. Among the various oxides of nitrogen, nitrogen dioxide (NO2) causes respiratory problems and contributes to acid rain. Nitrogen oxides also contribute to the formation of particulate matter in the air and nutrient overload in ponds and lakes, reducing water quality. Various oxides of sulfur are formed by the burning of sulfur-containing fuels, including coal and oil, and also during the extraction of metals from ores and gasoline from oil. When dissolved in water, sulfur dioxide and sulfur trioxide form acids, contributing to acid rain. They also damage the respiratory system and contribute to the formation of particles that reduce visibility in the air. In the presence of sunlight, nitrogen oxides can react with volatile organic compounds (such as gasoline vapors and chemical solvents) to produce ozone. Although ozone in the stratosphere exerts a protective effect by absorbing harmful UV radiation, ozone in the troposphere can irritate the lungs and cause inflammation, wheezing, coughing, and breathing difficulties. Repeated exposure to ozone can permanently damage the lungs. Ozone is a major component of city smog. Particulate matter is a mixture of a variety of microscopic solids and liquid droplets, including metals, nitrates, sulfates, organic chemicals, and dust. The main concern is for small particles, with a diameter of 10 micrometers or less, as they can readily enter the lungs during the normal process of breathing. Particle pollution is linked to various problems, including difficulty breathing, chronic bronchitis, aggravated asthma, and irregular heartbeat. Lead in the air is produced mainly by lead smelters, and also by waste incinerators, utilities, and lead-acid battery manufacturing plants. Exposure to lead can damage various body organs, including the brain, kidneys, and liver, and can cause osteoporosis and reproductive disorders. To reduce the emission and accumulation of such pollutants, the governments of various nations have mandated measures such as the use of reformulated gasoline, catalytic converters in motor vehicle exhaust systems, and effluent traps for industrial wastes. In addition to the problem of pollution, there is concern that global temperatures are rising as a result of increasing levels of greenhouse gases—such as carbon dioxide and methane—in the atmosphere. Greenhouse gases generally play a valuable role in that they absorb some of the Sun's heat and help keep the Earth warm and habitable. The concern is that a rise in the level of these gases is leading to the phenomenon of "global warming." Many scientists associate this rise with human activities such as the burning of fuels, land clearing, and agriculture. Others attribute global warming to increasing solar activity or other natural phenomena. In addition, the extent of warming caused by greenhouse gas emissions is being debated. Vercheval, J. The thermosphere: a part of the heterosphere. Retrieved June 23, 2015. This page was last modified on 26 September 2017, at 15:30.